If you are having a lot of traffic to your website, but not getting a lot of leads, then it means it’s time to get serious about conversion rate optimization. To uplift your conversion rate, all you need to do is just three simple words: Conversion Rate Optimization. If you are unfamiliar with this the term, here is the best way of phrasing it: “Conversion rate optimization, generally referred to as CRO, is the process of optimizing your website to convert more visitors into customers or any other goal your website intends to achieve”. A conversion happens when your visitors respond to your goal, whether that’s completing your form, buying your product, subscribing to your email list, sharing your content, signing up for an event, calling a certain number, downloading your app, etc. A website conversion rate is influenced by many factors. Sometimes just a small tweak can lead to significant enhancement in conversion rates. Acquire more customers, increase your revenue and grow your business by applying the below conversion optimization tips. The first conversion optimization tip is to properly define the targeted audience. One of the major mistakes many marketers make is trying to please everyone. Do you think everyone will buy your product or service even the product or service is useful for everyone? If you think so, you are wrong anyway! Based on your product or service, your research and analytics data and of course your personal experience, you can determine who will actually need/want your product or service. Your online marketing and website should be geared specifically to persons who are most likely to convert. You should know who you are talking to and what will make them to purchase your product or service. Understanding your competitors is imperative to increase conversions. If you can identify your top three competitors, then you can start to examine their online marketing efforts and websites to understand where you require some improvements. If you evaluate yourself against competitors that are truly similar to you, the insights you gain will be much more valuable. A unique value proposition (UVP) is one of the most important conversion triggers. It delivers the clear benefits of your offer and tells the visitors why they need to purchase from you and not from your competitors. Your unique value proposition is what sets you apart from your competitors. Use something as a unique value proposition that is difficult for your competitors to duplicate. When you design your website, just remember the three words “jazz it up”. It means your website must be visually appealing, exciting and engaging. Your website should provoke emotion from your visitors. An unprofessional website design can turn off most of your visitors and that’s why designing a professional-looking website is considered as one of the effective conversion optimization tips. If you cannot create a professional-looking website by yourself, consider hiring an expert web designer to give it a professional look. Include a video on your website to demonstrate how your product or service to be operated. It works better if you offer something complicated. StacksandStacks reported that people were 144% more likely to buy after viewing a product video. Be sure that your video is no longer than 2-3 minutes because no one has the time to watch long videos. Keep it sweet and short. Vidyard increased conversions by 100% by using video on their home page. Every image in a website should have a purpose like to push your audience toward the conversion goal. If you are using the images to break monotony of the text, you are completely wrong. Only use the high quality, meaningful and relevant images where possible in your website to grab the attention of your target audience. Avoid using tacky stock images as they can send the wrong message to your audience. Your website must be responsive. 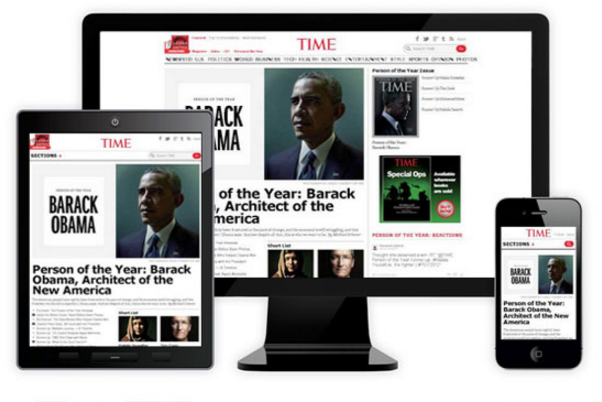 Responsiveness allows websites to automatically change layouts according to the visitor’s screen resolution, whether on a desktop, smartphone, or tablet. Adobe analyzed more than 1000 websites and discovered that around 15 % visitors came from smart phones and tablets. That means if your website is not responsive, then you are losing some potential customers. Keep the message and look of your landing pages consistent with your ads and main website. If your visitors see the same message and design on your ads and landing page, they recognize your brand quickly and this assures your visitors that they have been redirected in the right place. Make sure you deliver exactly the things on your landing page what you have promised on your ads. That will increase the visitors trust over you. Your website loading time should be below tolerable attention thresholds—ideally less than 3 seconds. If your website takes too long to load, many potential customers won’t bother to wait. There are several studies that recognize the loss of conversions and sales correlating directly with the website loading speed. Headline is generally one of the most noticeable things on a web page, getting it right can increase your website conversions to a great extent. Just take a look at the below example, how Movexa made the headline more clear just by adding one word, which boosted their conversion rates by 89.97%. Your headline is what grab your visitor’s attention and intrigue them to read further. Therefore, give yourself some time and brainstorm at least 10 possibilities before choosing the strongest one. People don’t care about you and your business. They only think about themselves, and they want to know how they can be benefited by using your product or service. Write your copy in a way that speaks more about how they can be benefited by using your product or service. Furthermore, you can make your copy customer focused by using more “you” and “your” instead of using “we” and “our” in your copy. The majority of your visitors don’t read your copy; they skim your copy. Using bullet points make your page more scannable. Bullet points make text easier to understand. People absorb more content if the page is easy to understand. Therefore, summarize the benefits of your product or service as bullet points before you ask to buy. A neat example is taken from 24/7Techies. On internet, most of the people don’t read the web copy – they scan. A study by Jakob Nielsen revealed that people only read 28% of the text on a web page. Scanners, the most common, are scrolling through your webpage and only read the highlighted points. These types of readers will read the main points and then read further where their interest is grabbed. Those who will read almost every word of a page. For maximum conversion, make sure that your website copy is formatted for every type of readers. I have already mentioned that most of the online readers are scanner. If you copy is a big chunk of unformatted text, then most people will not bother to read your copy. Break the paragraphs in small chunks containing no more than 3 lines. Make sure your copy does not exceed 50-60 characters per line including spaces. The font you choose for your copy must be easy to read on screen. The following standard serif fonts are easily readable on screen. If you are using a font smaller than 12px, many research found that Verdana is the most readable font. If you are using a font over 12px, then Arial is the most standard font. Spelling and grammatical errors instantly undermine your credibility. If your website is riddled with spelling and grammatical errors, your visitors will leave as fast as possible because you look careless at best and unprofessional at worst. Why should people trust you if can’t spend some time to proof read your website? Therefore, proof read your copy at least 3-4 times to avoid the spelling and grammatical errors. When you write sales copy, leave your degree at the door. Use simple English in your copy so that your visitors can easily understand your messages. It will help to steer customers towards taking the action that you want them to do. People won’t read your copy, if they need to open a dictionary to understand your copy. They will leave. Write your copy in a way so that even a fifth grader can understand your copy. You must include the blog section in your website. Posting valuable articles in your blog is an effective way to keep your visitors coming back for the new insights. If your posts add value to the readers, you will create a strong following. Don’t forget to display social sharing buttons prominently in blog posts. If people get valuable information, they will share it in their social networks. Only provide the information on your website that your visitors would need or want. If you think any part of your content is not useful for your audience then remove it. I generally call them “Filler content”. The more filler content you have on your website, the more distractions there are to guide visitors away from converting on your website. 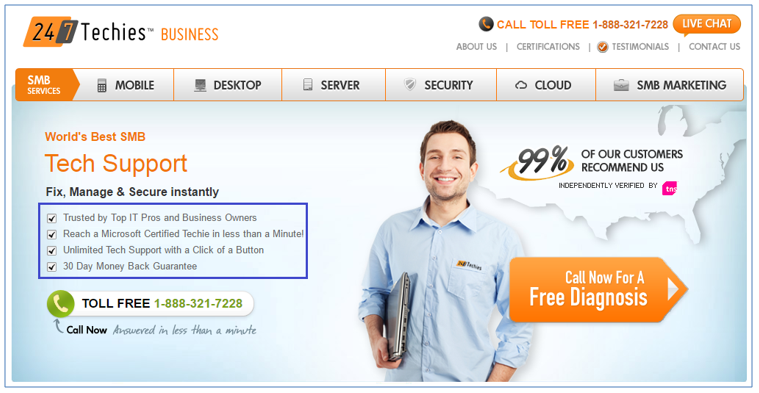 Your call to action button color must be contrasting with the background color. Having a contrasting color in your CTA makes your button visually stand out from the rest of the page. For example, if you use the blue as a background color, orange could be the best choice for your CTA button color to make the button stand out. Take a look at the screenshot from below unbounce, the CTA button clearly stands out from the rest of the page. You must use specific action-oriented button text so that your visitors can understand what will happen if they click on your button. For example, “Get Started Now” is much more specific and powerful than simply saying “Submit”. In fact, CTA buttons that say ‘Submit’ rarely win in A/B test against other words. You can also create sense of urgency by adding action words in your CTA button like “Immediately”, “Today”, “Now”, “Instantly”, etc. Instapage used “Get Started Now” as a button text. Larger CTA buttons generally get more clicks. However, don’t make it too big that does not fit with your page design and don’t make it too small, which can be overlooked. You need to make sure that easily identifiable as a CTA button. Do split testing to identify the perfect size because a tweak in button size can attract more clicks. Place your call to action button above the fold because the visitors who never scroll down in a web page will miss your CTA button. On the other hand, for a complicated and expensive product, your visitors want to know further details about the product. In such cases, visitors won’t click your button if you only include the button above the fold. Therefore, for the long pages, repeat your call to action button once in every page so that your visitors can find your CTA button whenever they want. Urgency is when the visitors feel like they need to act quickly. Most people don’t want to miss out on an opportunity. Urgency helps push them along into taking the action immediately you desire. For example, use the phrases like ‘only 2 left’, ‘offer expires Friday’ or ‘Order in the next 1 hour for delivery today’ as they create urgency to take the action immediately. On the other hand, make sure you are not creating false sense of urgency by stating there are ‘only 2 left’ when it’s a digital product and that number will remain same even someone place an order. Move your visitor’s attention to the most important element (i.e. your form or call to action button) of your page by using arrows or other visual cues. For example, if you see an image of someone looking to something, naturally you will look there too. Just take a look at the below screenshot from GoTomeeting, how perfectly they have used this technique. Keep plenty of breathing space in your design so that it draws the eye in toward the call to action. If your visitors need to search for a CTA button, they will not be amused. For example, you are in a website to book a ticket to watch a movie and if you are not able to locate the “Book Now” button means it’s like hiding the cash counter. More breathing space equals less noise, making it easier to focus. When you ask for visitor’s information in your form, ask as few information as necessary. Never try to make your task easy by adding extra fields to be filled in by your visitors. Before adding any field in your form ask yourself again — do you really need the information what you are going to ask? To make the things more clear, let me give you a case study result here. A case study by Erin Hogg revealed that, one additional form field decreased conversion rates by 11 percent. If you need a large amount of data from your visitors to qualify as a lead obviously, you will have to use the long form. As you are almost bound to use a long form, make it easier for the visitors by breaking out the process into steps or pages. It will make the things easier for the users to digest. We all know more field means less conversions. But, what would you do if you need to have a large number of fields in your form to qualify as a lead? Offer autofill fields. For instance, if the customers enter their post code or zip code, automatically pull the entire address. It’s less typing for the customers which will encourage the users to complete the form. Show a progress bar for multi-step funnels. It motivates the users to complete the purchase as they can see on the progress bar how many steps need to be completed. If you don’t use a progress bar for multi-step funnels, your visitors may think there are lots of steps they need to complete. As a result, they may leave the page before completing the purchase. Just take a look at the below example, Godaddy has a progress bar. Your visitors are very wary of potential scams on the Internet. By adding your full-contact information, you can prove that you are running a real business. Therefore, make sure to include the following information on your contact page. Live chat is one of the most satisfying customer service channels. Your potential customers may have the final question before they purchase your product or service. Offer live chat to alleviate any concerns potential customers may have. Particularly for the complex and expensive products, live chat can mean the difference between a sale and an abandoned cart. Intuit boosted their conversions 211% just by using this technique. I love your website and your products are so cool. ~ John, UK. 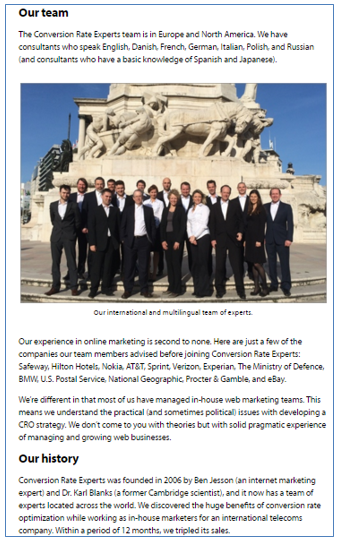 Make sure you include the real testimonials with full names, and pictures of your customers. Adding a real testimonials on a website is considered as one of the most effective conversion optimization tips! People will only purchase product or service from your site, if they trust your site and the trust seals can help to earn the visitor’s trust. 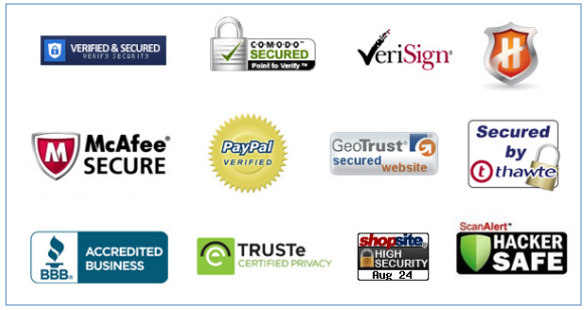 Use trusted logos those are familiar like BBB online, Verisign or Hacker Safe to increase credibility of your website. Petco.com increased sales by 8.83% just by adding the Hacker Safe seal. 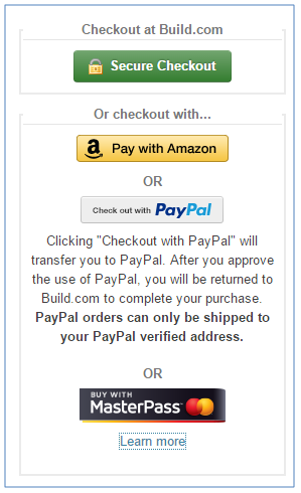 Display the credit card and paypal logos in the footer and checkout area. Having these logos in a website serve different purpose like it has been shown to create trust and it also assures the customers your online business has been around for quite some time. 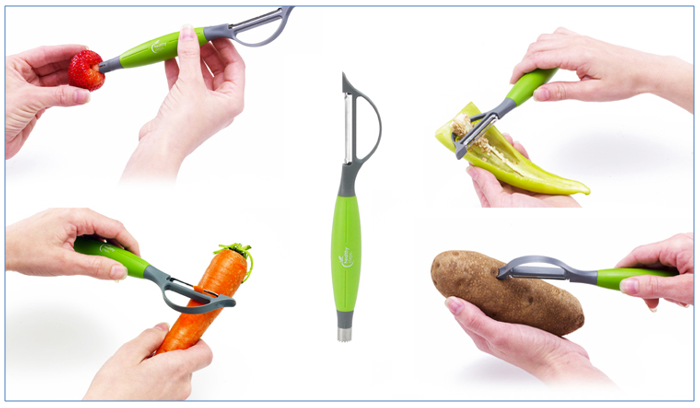 Just see how perfectly Shoon has utilized this technique. By displaying the suppliers and partners logos on your website, you can increase the visitors trust because others have chosen to work with you. Your visitors will naturally think, if others can trust your business then why not we? Adding the logos of partners and suppliers adds instant recognition that text alone cannot express. The below example is taken from Southamton Computers. When your visitors will see the best companies in the world have purchased from you then they won’t hesitate to purchase from you. If your business is good for the big companies, then your business more than good enough for your visitors too. 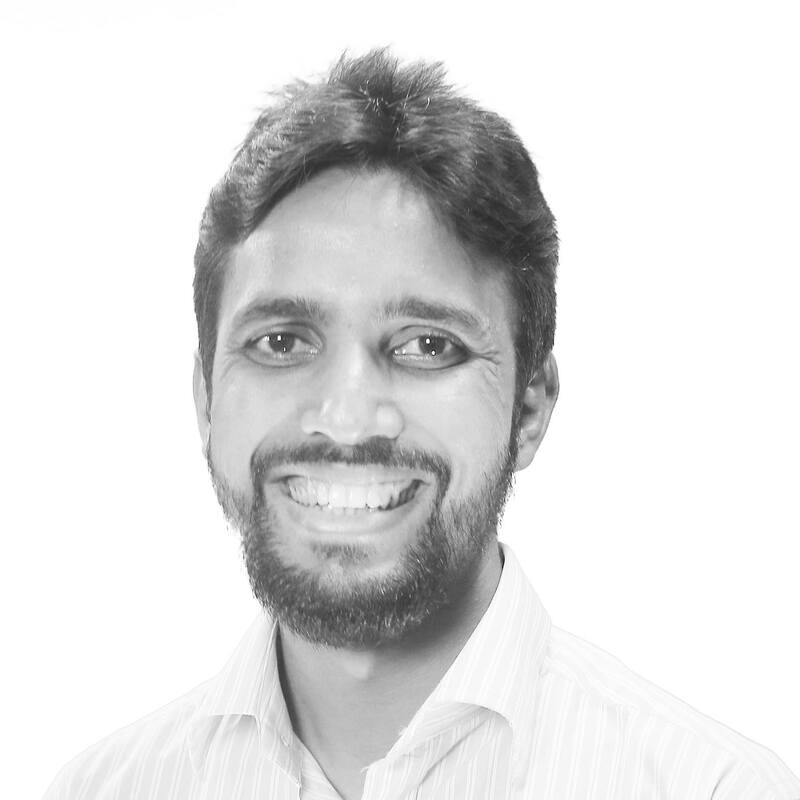 Backlinko has endorsements from Neil Patel of Quicksprout and John Jantsch, the author of Duct Tape Marketing. Asking people to provide sensitive information on pages that are not SSL secured is reckless in the virtual world. Get an SSL certificate and protect the pages that accept sensitive information such as payment page, log-in page etc. Make sure your visitors see the SSL padlock icon in the browser. You might have heard that social proof can increase your website conversions. But, for example, if you have 20 customers and 20 Facebook likes, your social proof can actually backfire. So, make sure you hide the negative social proof that appear on your website. Once you reach to a healthy figure then you can display and that will help to increase conversion rates. Your application could be easy to use for you as you are spending whole day with it. But, it may not be that much easy to use or understand for the visitors. Therefore, guide your visitors through a demo tour of your product instead of providing screenshots. That way, you hold your visitor’s hand throughout the process, which makes it more likely they will stay with you. Feature your best-selling and most profitable products in the above the fold area of your website. This applies to your homepage and category and product pages. As a result, most of your visitors will get their desired product or service once they will arrive on your site. If they find the desired product or service upon arrival, it will make them to stay on your site to take the action. Listing the features of your products or service is important, but it is even more important to tell the customers how your product will solve their problem or help them. Use copy that focuses on the joy of benefits over the stuffiness of features. Sales pages for expensive and complex product usually require more information. Because your customers need a lot of convincing to invest specially in an expensive product. Place yourself in customer’s position and think would you spend a big amount of money without knowing the product or service properly? Therefore, if you have a pricey and complex product, don’t hesitate to provide a little extra information. Your product or service might be expensive and some of your visitors might not have a sufficient budget to pay the full price. Furthermore, they may not require all features you have in your product or service. Therefore, divide your larger product or service into different versions so that your customers can buy according to their budget and requirements. 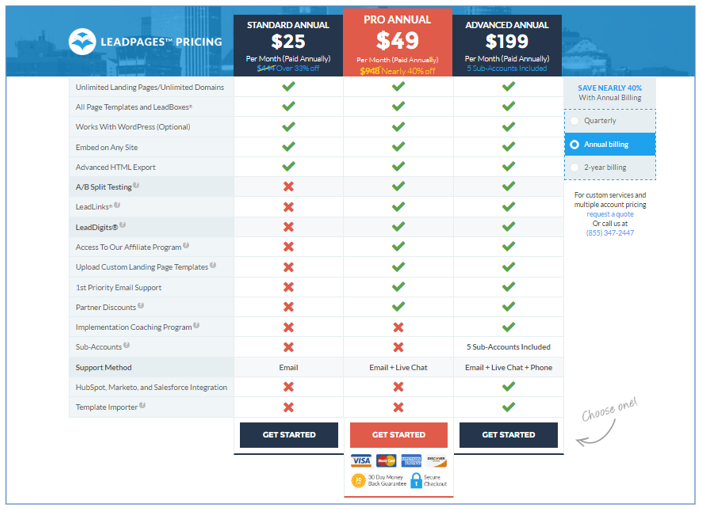 Leadpages has standard, pro and advance versions. Give at least 3 logical reasons why people should buy your product or service. Provide a list of every reason why should people buy from you. You need to prove that you are better than your competitors like offering the lowest price in the market, having more features than the competitors, etc. Almost half of online orders include free shipping. As half of online orders include free shipping, your audience also expect to get the free shipping. If you charge even a small amount for shipping, that could kill your conversion rate. A study by comscore found that 47% stated that they would abandon the purchase if there was a shipping charge at checkout. You would get higher conversions even if you increase the product price to offer the free shipping. Your visitors want to see what your product looks like from different angles and what it looks like when it is being used. As online shoppers can’t touch or see the products physically, having lots of images from different angles will help them to view the product more closely. On the product page you could include the estimated delivery date beneath the call to action button if the visitors make the order immediately. It would give them a clear reason for making the decision quickly. You could either say Next-day delivery available or you could be more precise by showing the exact timing on the next day. When you buy something from a shop, you know where the shop is and if anything goes wrong you simply have to go there to return the product. On the other hand, with the web this is more of an issue as people cannot try things on before purchasing. Therefore, having a clear return policy on your website will eliminate the fear of your visitors as they will have the information what needs to be done to return the product. If you have a large volume of products, then add product filter options. By using the product filtering option, people can choose to see only items that fit to their style and budget. Otherwise, people have to search for the desired products manually and its time consuming. A study discovered that, 76% boost in revenues just by adding a product filter option. Your visitors want to touch or try a product before they purchase anything but those things are not possible unless it’s an online software. However, having a zoom in option for your products will allow the users to see the products closely before they buy. Improve the presentation of your products as much as you can because the presentation of your products will have a direct impact on how well they sell. For example, clothes look better featured on a human and digital e-books are more desirable with a professionally designed cover. The small amount of money you invest to improve the presentation of your products will ultimately convert into higher sales. The case studies on how your product or service has been successful in the past can grab the new visitor’s attention easily. This is an excellent way to show your expertise and innovation. If any particular product that helps people, then explain how it helped a specific person. If you provide service, then describe how your service helped a customer to achieve his/her own goal. If the new visitors see that other people are using your product or service, then of course they won’t hesitate to give a try. Some websites ask to register first and it’s obligatory in order to make a purchase. If you force buyers to create an account, you might be losing out some potential customers. In fact, 26% of people say that they wouldn’t buy if they are forced to register for an account. Therefore, it’s better to let your customers buy as a guest without creating any account. Your visitors want to see what others say about your product or service. When your visitors are not sure whether it will meet their requirement or not, in such cases there is a very low possibility to purchase your product or service. Reviews from the other customers can assure your visitors that your product/service can serve their requirements as it helps others. If you can make your customers happy, then they will not only keep coming back to you, but also they will bring some new customers. Your happy customers will encourage other people to try your product or service into their circle. Never underestimate the power of referrals and word-off-mouth. This website gets good amount of referral customers from their happy customers. When your customers are happy, they share with others. Similarly, unhappy customers are typically 10 times loud and ready to share their bad experience than a happy customer to share positive experience. Keep an eye on customer’s reviews and reach out to unhappy customers directly and ask them what you can do to make it right. This will prove them that you care about them as a customer. Customer surveys allow you to get valuable insights from customers who have already brought your product or service, helping you understand what mistakes you made that could have cost you a sale and what convinced them to buy. That’s why it is one of the most important conversion optimization tips. A key factor to boost conversions is giving visitors what they want, at the right cost and at the right time. Use the customer survey data to make the changes in your website that will help you to provide the way your visitors want. When people contact you by using contact form or via email, sending an auto response will assure the user that you have received their inquiries, and they will receive a detailed reply later. Make sure you comply with your promises; for example, if you say that you will reply within 24 hours, you need to ensure that you reply within that time. If possible avoid using ads on your website because people don’t like popups, hype and blinking banners. People associate it with spam and scam. If there is really a need to put ads, clearly distinguish the sponsored content from your own. Your customers want to be sure that they are not being ripped off. The price match guarantee proves that you are concerned about keeping your prices competitive. Assure your customers that you are offering the best price in the market. Furthermore, If possible, show them a price comparison with your competitors to prove that you are giving the best price. Some people are scared to purchase a product or service if it does not have a money-back guarantee. You can increase the visitor’s confidence just by stating: ‘we will happily give your money back if you are not happy’. Moreover, money-back guarantee tells the visitors that you are confident in your products, and they won’t lose anything even if they misunderstood something. If the industry standard is 15 days, make yours 30 days. A prominent and distinct visual presentation of your features and prices helps your visitors to make quicker decisions and remove anxiety. Your prospects should get the clear information about how much does it cost, what features can they use for this package and can they give a try for free. 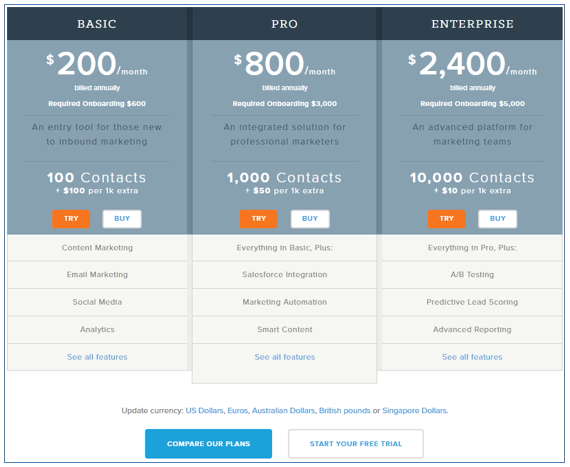 Hubspot has a prominent pricing table with all features. Many companies try to increase sales volume by slashing the prices. This can work but it can backfire as well. For many products, higher prices increased the number of sales because people rationalize that if something is more expensive, it must be better. For example, a pen that costs $69 has a higher perceived value than a pen that costs $10. So, using higher prices for the products can increase the conversions. Let your visitors test your product or service with a free trial offer. With the free trial, they will use it in the real world. If they are satisfied with your product or service, it is more likely that they will move forward with a purchase because it’s proven and invested some time to configure. In order to entice people to become follower or subscribe, give away something valuable like e-book or e-course for free. Through this you can educate the potential clients on things they are interested in and you will be able to make them understand why your product or service is the obvious choice for them. Some of your visitors want to buy your product or service right now, but they don’t have adequate balance in their debit/credit card to pay the full price. Having a payment plan option can solve the problem for those who are hungry for your product or service but don’t have the balance instantly. People who come to your website for the first time to purchase something, they may not prefer to use their debit/credit card to make the payment due to security issue. A survey of 2000 online British adults in 2009 found that, 50% of those who regularly purchase online said that they would cancel the purchase if their preferred payment option is not available. So, offering multiple payment options like PayPal or Amazon payments make you win over at least some of the customers you would lose otherwise. Build.com is offering multiple payment options. People reach to your registration page does not mean that they will complete the registration. They still might think for the other options. Therefore, provide them some extra information like benefits or guarantee in registration page to reassure them they indeed made the right decision. I took the unbounce registration page as an example to make the things more clear. They are again reminding it’s a free trail; the plan can be changed and the account can be cancelled at any time. 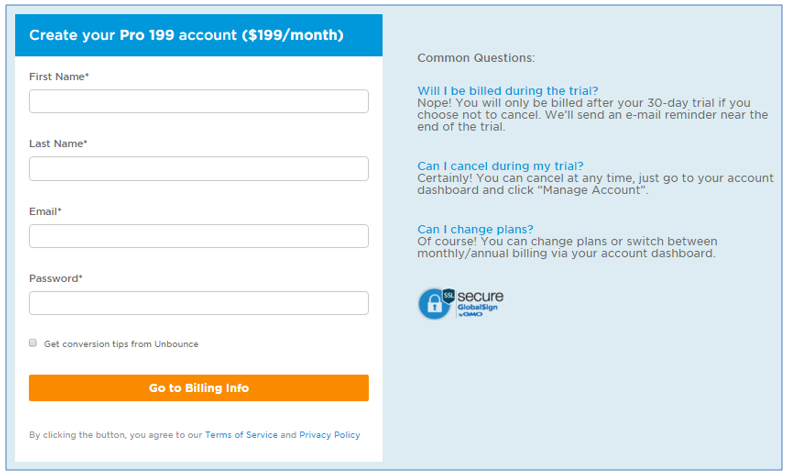 If you haven’t already tried in your pricing, test ending your prices with “9”. Several studies found that “9” tend to perform better than prices that end with any other number. In one of the experiments done by MIT and University of Chicago, a standard women’s clothing item was tried at the prices of $34, $39, and $44. They found that, the item sold best at $39 than at either of the other prices, including the cheaper $34. Promotions can significantly influence people to make purchases. If you notice your conversion rates gradually falling down then consider running a short promotion and make it clear when the promotion ends. It will create a sense of urgency to buy your product instantly. Be transparent about all costs associated with the purchase as people don’t like hidden fees. If you charge for handling, shipping, or other extra costs, be upfront about them early on in the checkout process. According to Shopify, 56% of shoppers leave without completing their purchase due to unexpected costs. You should start running various A/B tests once you have your website up and running to determine which version drives more conversions through your website. You can run A/B testing with almost anything on your website like homepage layouts, call to action buttons, headline, ad texts, form fields, form length and so on. If the results did not turn out what you had expected, you can always go back to what you had before. Multivariate test is a test where we test individual page elements, instead of whole pages. Different versions of these individual elements are combined to make different version of the page. Traffic is then distributed to amongst those versions to figure out which version gets maximum conversion. By running multivariate testing you will be able to find out which page combination performed better, and use it moving forward. Eye tracking is a method used to gain strong insight where people look at when they visit your website and the types of elements that most catch their attention. In order to improve your conversion rates on your website, you have to look at where the visitor’s eye is going and based on that you need to place the conversion elements. Heat map is an excellent technology to determine which areas and elements on your website are most often hovered over. Analyze the data from the heat map for your website and see if it aligns with where you want people to focus and keep their mouse. If it doesn’t align, then you probably have to make some changes. Usability is extremely important for website conversion. If your website is hard to understand or difficult to use means it has usability problem, and it will result in poor conversions. Your visitors should be able to navigate your website efficiently and quickly. Visitor segmentation allows you to speak to your different target markets uniquely with the different message according to their requirements. So, how do you do the visitor segmentation? Let the visitors identify themselves on your landing page by asking their unique needs and then present them with the relevant sales page. Provide a clear explanation of the product or service so that visitors have a clear understanding before they purchase your product or service. Leaving people in the dark by not giving adequate information for the product or service could hamper your conversions because no one would buy your product or service until they get the sufficient information. This includes showing the number of successful users of your product. Imagine, your product is used by 10,000 people, and if you display this information, it will motivate the new visitors to use your product. 10,000 people can’t be wrong! This is what they will think. Make sure you show the exact number to your visitors. By telling the exact number you can earn the visitors trust. For example, 91 Conversion Optimization Tips vs. Lots of Conversion Optimization Tips — which one do you think is better? 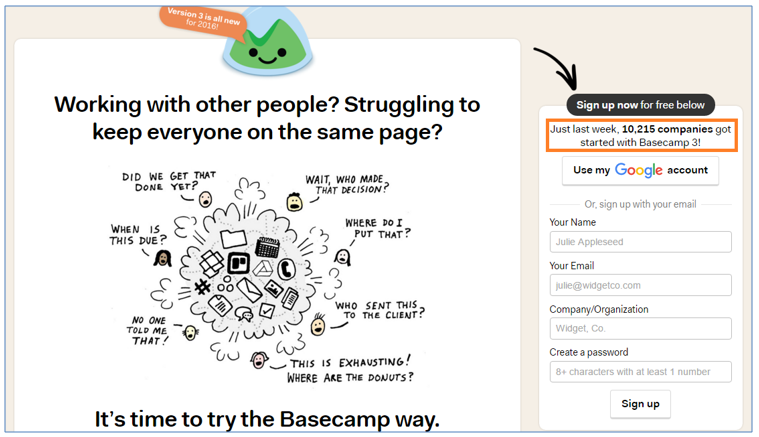 Basecamp uses this technique perfectly. By requesting the email address early, you can follow up with those who abandon during checkout by sending automated email. You need to ensure that the automated email goes our immediately before they make the purchase from somewhere else. That way, you will be able to bring back some of your potential customers. When your visitors need to provide their personal information, they are always worried about their privacy or security of their personal information. Having a message like ‘we will never spam you’ or ‘we respect your privacy’ near call to action buttons on all forms that ask for personal information will eliminate the doubt of your visitors about their privacy. It also makes your visitors more likely to complete the form. People want to get more and more information before they purchase any product or service. Add a FAQ page on your website to answer the every questions your visitors generally ask. Put yourself in the visitor’s shoes and ask yourself what questions you might have asked as a visitor then answer them on your FAQ page. People generally trust more long established companies than new ones. If you have been doing business for many years, let your audience know that. You may consider adding this information on your “home” page or “about us” page. Telling that to your visitors would help to trust you more. Having a dedicated landing page for every ad campaign is another important conversion optimization tips. If you are running pay-per-click ads, be sure to send those visitors to a dedicated landing page. I have seen many people sending their all traffic to their homepage. Don’t do this! If you do so, visitors may not perform the action what you want them to do as your home page might have several goals whereas landing page has only one goal. A perfect landing page provides all the necessary information required to inspire visitors to convert. Your landing page is the place where the visitors will land first and read your content. Therefore, your landing page needs to be as complete as possible. This means your landing page must contain all the necessary information like product specs, prices, expected delivery date, etc. Provide a factual history of your business like how you started the business and who operate the business on your about us page. It is also good to include the pictures of your team and office photos. In this way, you are actually showing to your visitors that you are a real person with real interests, and it also helps to gain the visitors trust. When people come to your site at first time, give them some options to engage with you even if they don’t purchase or sign up straightaway. The options could be watching a video or using a free trial. When they will get the adequate information and see the benefits of your product or service, they will automatically be interested in your product or service. 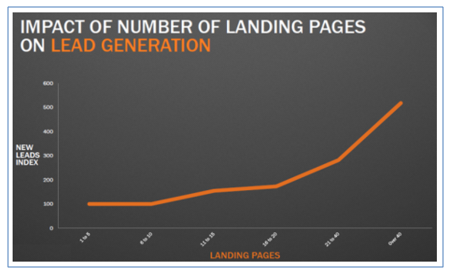 Websites with more landing pages convert more visitors into leads. Having more landing pages means you can make more personal offers, and search engine can send more targeted traffic on different landing pages. A study by Hubspot found that, companies with 10 to 15 landing pages generate 55% more leads than companies with less than 10 landing pages. When you find coupon field on checkout page, what do you do? You normally go to the search engine to search for coupon code. But, sometimes you never go back to the checkout page. So, removing the coupon field from your checkout page can reduce the shopping cart abandonment significantly. Pricey products or services take long time to sell. People won’t spend 2-3 grand without a lot of nurturing. Now the question is how would you do that? The best way to do that by email. Focus your marketing on email collection, instead of going for hard sell. Then educate them by sending emails. You will sell more in the short and long term. By working through the above listed tips you will go a long way to improving your website’s conversions. Additionally, you will also create a better user experience for your users by implementing the above conversion optimization tips. When you make the changes in your website, I recommend taking small steps and measuring the outcomes along the way rather than making changes all at once. That way, you will be able to identify which changes had the biggest impact on your conversions. The key to successful conversion rate optimization is refining, testing, tweaking and measuring the outcomes. Excellent checklist of conversion rate optimization tips. I launched an e commerce site for three months and wouldn’t get good results. I don’t think it will possible for anyone to follow the complete list. Nevertheless, I would try to pick some of those and would implement it on my site. This is a great list, thanks for sharing. I love the way you always break up your content with humor and images. Very easy to understand. Thanks again for adding tons of value. Hi, amazing list of tips. We need to try some of them. Thanks for sharing! Engaging people through video or leverage a free trial option can enhance your first impression is true indeed. However, at the same time, if you have given the right information, which they are looking for, then you are on the way to expect some real customers. Thanks for the great advice!! I will try to implement some of the mentioned tips right away! 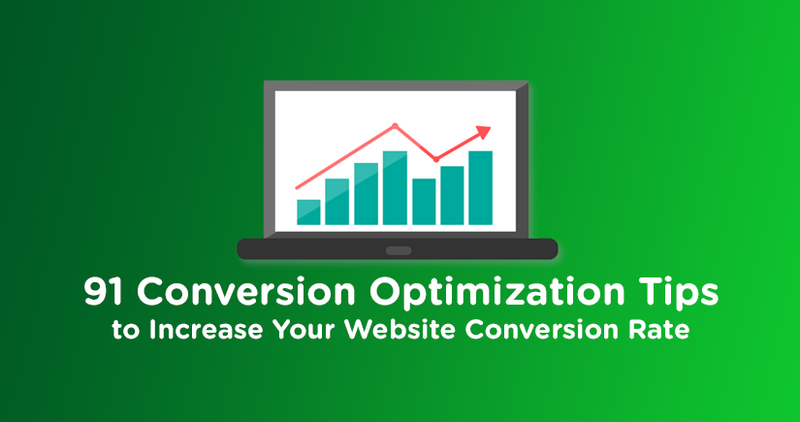 You have covered almost all points to optimize website conversion rate. Once a customer satisfies with your product, option for different payment option for customer makes a hazzle free and easy transaction experience for him. One should aware about popular transaction option trend. For online marketing clear and reliable warranty/guarantee offered by company is most important check list for customer. Also one should focus on complaint section regarding their service and on customer satisfaction. Almost all tips u provided are very useful. Nice. This was a thorough checklist of things to include in a website. I’m a big advocate of blogging and it’s a great way to keep publishing new posts for both your audience and for search engines to to index. This will definitely help with building organic traffic as well as direct traffic resulting in a big loyal following. Thanks for sharing Jabed! Have a great rest of the week! I always wonder “Conversion ” is a tough subject for me. However, after reading this, I got some clear ideas, that where we made mistake and what should be our strong zone in CRO. Great article with some great tips to increase website conversion rate. All the point you mentioned in the post are very important and helped me a lot for my website. One thing I would like to add to the list is implementing social login to your website. It will boost traffic to the website by making the registration process simple and quick. What are your views Jabed?